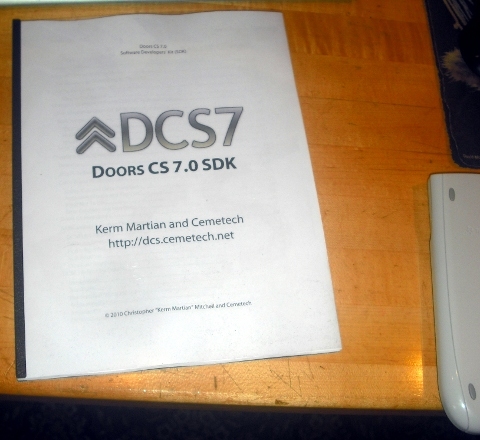 Doors CS 7.0 is due for release by September 1st, 2010, so a month in advance, here is the Software Developers' Kit or SDK. Besides an exhaustive, 124-page summary of all the features and routines that Doors CS 7 offers to BASIC and ASM programmers, this SDK contains a full toolchain to compile and build z80 ASM source code into .8xp files, all the necessary tools and include files, and additional programs to simplify writing headers for BASIC programs. If you are interested in developing for Doors CS or even learning about what it offers to programmers, this SDK is a must-have. I spent the last week or two working on this, but the compilation tools inside are the ones I have been using to develop programs over the past five years with great success. I've used it under a variety of platforms, and I think it will work to make ASM development a lot easier for newcomers to the community or to the language. In addition, the extremely detailed documentation on Doors CS' ASM and BASIC features should make it simple to find any information for which a developer may be searching. I look forward to many DCS programs being written soon, and I hope some of them will merit features here (besides of course being valuable entries in the upcoming contest! Kerm, epic stuff, this will be very very useful to me! I'm very glad to hear it, and I hope you find the toolchain relatively easy to use. I tried to make it as straightforward as possible, so you can be one of my guinea pigs. Well, I didn't design it for drag-and-drop since the source code files are generally in a different directory than the compile script and the compilation tools, so that explains why that doesn't work. Glad to hear that it's relatively simple, and I hope it created proper .8xp's with no adjustments necessary? Very happy to hear it. Now you can make mobileTunes 3 songs to your heart's content. you can also just leave the terminal open, and press up-enter every time you want to reassemble the same thing. You can also make a new batch file, for example docde7.bat, containing "compile docde7", then just run docde7 at your command prompt. Exactly, you could even make it a one-letter command, although that might get confusing over time. Did anyone get a chance to read over the SDK? I printed myself out a copy and am bringing it to Kinko's this afternoon on my way to return some books. I'll post a picture when it's done. *bump* A bound SDK! Laser-printed in color, bound at -K-i-n-k-o-'-s- FedexOffice with a velo bind, black plastic back, clear plastic front. Look and feels quite pro in person. Or do we have to pay extra for a neatly bound document at our own Kinkos? The latter, I'm afraid, although if the winners of the contest are very, very nice to me I may ship them their own copy. You got it printed before I finished proof reading! I only made it through page 17 before I had to go help install a ceiling in the freezer room, but I found a few improvements to be made. the Using XLib and Celtic functions paragraph needs heavy duty rewriting. - page 16: what not to do "You may be able to abuse Celtic III into performing the actions you desire, but neither I nor Iambian are responsible if it crashes because you used incorrect arguments. - page 17: "such as those for manipulating a stack of Ans variables; performing collision detection; working with text; and creating quick, attractive menus." Get rid of the first comma in "For information about the GUI stack functions" sentence. Duly noted, and corrections made. Keep in mind that much of that was ruthlessly ripped from the Celtic III readme, and that it was also 3am when I finished the SDK. I also think there way be an elusive issue with BinPac8x and Python 3.x; I'm working on verifying it. Whoa, those look awesome, Merth! What kind of binding is that? It's called a "cover bind" or something like that. I got it done at Staples. It's like a softcover book, actually. It's pretty ace. Anyone want one? Staples has my order for three months, so I can make more! how much did those cost you guys to get done? © Copyright 2000-2019 Cemetech & Christopher Mitchell :: Page Execution Time: 0.199402 seconds.